Sub: Government’s decision on recommendation of the 7th Central Pay Commission Transport Allowance to the Railway employees - Deprival of higher rate to those working in pay Level 1 & 2-reg. Ref: (i) Railway Board’s letter No. PC-V/2017/A/TA/1 dated 17/08/2017 (RBE No. 96/2017). (ii) NFIR’s letter No. IV/NFIR/7CPC/Allowance/20l6/Part I dated 28/08/2017. Federation does not agree with the View taken by the Railway Ministry in this case as conveyed to NFIR vide Board’s letter dated 17/20-11-2017. Federation wants that the Railway Ministry should prepare proper case based on the facts and contentions of NFIR as explained in our letter dated 28/08/2017 to be placed before DoP&T/MoF. II. Federation reiterates that as a result of issuance of instructions dated 17/08/2017, a situation has arisen wherein the Railway employees in Pay Level 3, drawing pay Rs. 21,700/- and above upto Level 8 hitherto entitled for Transport Allowance @ Rs. 3600 + DA thereon (in Al/A class cities and in other cities @ Rs. 1800 + DA thereon) have been deprived of the said rate due to the new norm for entitlement only when their pay reaches Rs. 24,200/-. Above position reveals that all the employees working in pay scale below Rs. 6500-10500 i.e. upto Rs. 6000-9800 (81 to S10A) were allowed Transport Allowance at the uniform rate of Rs. 100/- pm. in A1/A class cities irrespective of their pay. (b) The Railway Board vide circular (RBE No. 111/2008 - effective from 01/09/2008 and RBE No. 95/2015) had prescribed following rates for payment of Transport Allowance to the Railway employees. IV. 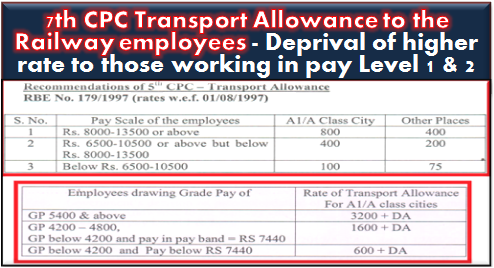 From the comparison of two tables mentioned above, it could be seen that the Railway employees were allowed higher rate of Transport Allowance on drawing pay Rs. 7440/- irrespective of Grade Pay/Pay Band. The modified Board’s instructions issued vide letter dated 03/08/2017 and 17/08/2017, have deprived the Transport Allowance @ Rs. 3600+DA thereon to those in Pay Level 1 and 2 (7th CPC) due to imposition of restriction i.e. reaching the pay Rs. 24700/- ignoring the fact that the staff were already drawing pay @ Rs. 7440 in 6th CPC Pay Band/Grade Pay. Federation, therefore requests the Railway Ministry to kindly arrange to make out case in the light of NFIR’s contentions for rendering justice to those staff of Pay Level 1 & 2 for granting Transport Allowance at rate i.e. 3600/- + DA thereon when they reach the corresponding pay @ Rs. 21700/- and not 24200/- to meet the ends of justice and refer to MoF.